In Fall 2018, we took Agata Lisiak’s class on Urban Sounds and Migration, which began with an introduction to the study of sound. We were encouraged to challenge the dominance of visual representation and to recognize the multisensory ways in which we experience the world. We aimed to take sound more seriously. Throughout the course, we focused on the complexity of sonic experience in the urban world, discussing street sounds, underground sounds, music, and language, among other facets of urban sonic life. Perhaps most importantly, however, we explored the intersections of sound with politics, particularly as it considers diversity and migration—what does it mean for a sound to have a social or political consequence? Sometimes, we practiced exercises to help us reach meaningful conclusions about sound. For example, one of our sessions was devoted to mapping the campus: in pairs or individually, students mapped out what the Bard College Berlin campus looked like to them, emphasizing the important landmarks and geographical elements, like streets. The mapping exercise led us to challenge the popular assumption that maps are objective representations of the world. When we looked at each other’s campus maps, we came to understand how little of the campus we frequent on a regular basis, and how the spaces that come to mind along “BCB” are uniquely familiar to us. We each have a different vision of the campus, distinguished by both subtle and major details. As a result, some students in our course have tried to frequent spaces on campus they do not normally visit: they have started using the kitchen in the dorm W15, making brownies in the Student Center, and studying in the Library with more regularity. Ultimately, changing daily routines and prioritizing different spaces is an easy way to gain insight into the experiences and perspectives of others and broaden your own horizons. What follows is a reflection on the implication of maps as well as the subjective maps generated by this exercise with an accompanying personal exploration of each. The final part of our article reflects further on the soundscape of Pankow. Because soundscapes are constantly evolving, so is this project—we are also inviting the BCB community to contribute elements of their experience of the campus space. Maps, as simplified visual representations of the world around us, allow us to contextualize our geographical place and to understand the complexities of space. Maps can help ground us in a specific time and place. Maps can be a guiding force as well as a means to describe and paint the world in this subjective, time and place-specific way. Maps give us a sense of direction and have the potential to cultivate a sense of public familiarity with specific places: once mapped, a familiar place becomes more easily recognizable. On a basic level, maps help us get around; usually it is only the places with which we are intimately familiar that we can navigate effectively without the help of a map. Importantly, maps do more than just fulfill the straightforward function of navigation: they also serve as representations of socially and culturally influenced ideas about location. Although maps are commonly thought to be objective and accurate geographical representations of the world, they are actually highly subjective and revealing of individual differences. Due to their subjective nature, maps can, at different times, function as both unifying and isolating forces. If everyone agrees on the basic structure and corresponding representation of a space, a strong sense of community, shared values and a unified worldview can follow. However, when perspectives differ, disparate opinions on representations of place can signify deeper and more fundamental oppositions or misunderstandings. This points to the complex interpretability of space. Another crucial, although perhaps less straightforward, function of maps is to make the world around us appear more accessible. Looking at a map gives us a better sense of where we are and how we fit into the larger world. Nowadays, digital maps (like Google maps) compress this space and make it malleable. They allow us to reduce the duration of a journey and they enable us to perceive space in all scales possible and from every angle imaginable. Ultimately, the better we understand our location, the greater our sense of control and power over the world becomes. Once we have a visual representation of the world at large and of our place within it, we are less likely to feel as though we are lost in the vast complexity of things and are conversely more inclined to put aside the fear of the unknown and to recognize our potential. In other words, when we see where we belong in the world, we understand our human right to engage and participate. With this, however, comes the question of access: what about the people who do not have access to a map or do not know how to read it and orient themselves within it? What if they find themselves on the map’s margins or do not find themselves on the map at all? When drawing the campus map, the members of our class wanted to make sure to include everything that defined the campus to us. We started off with a basic outline of all the buildings that constitute the campus and all the major roads that we travel along to get to these buildings. We both agreed that, from our perspective, the campus is defined by its surrounding tram stops and that the northern side of campus (without a tram stop) ends at SPOK. Then we each added our own personal perspectives to the map, including the routes we take and the places that we spend a lot of time in. These perspectives were ultimately very different because one of us lives on campus and the other one does not. Despite this difference, our ideas for the campus map were fairly similar. It’s also impossible not to notice that our map is similar to the campus map we received on our first day at BCB. Our approach to mapping the campus began with a discussion about what we felt were notable elements of the campus to focus on. Our perspectives differed as one of us used to live in the dorms and the other one currently lives in the apartments, and our main points of reference were the Kuckhoffstrasse stop and the Friedrich-Engels-Strasse stop, respectively. Surprisingly, we both saw the church as an important and necessary element of the campus map. Perhaps this heightened awareness stems from the fact that we are both Jewish and do not regularly encounter churches. As a result, we both find the church on Platanenstrasse to be an important landmark to pass; with its bells and eager Sunday worshippers, it is a vital part of the background of BCB’s campus. When working on the map, we both struggled with dimensions and sizes: we were unable to draw things to scale accurately and we kept misaligning the different spaces on our maps. We thought it was strange that we could not envision even one of the houses along the street and had completely forgotten about the Factory until we were almost done mapping. I started my map by drawing the dorms where I lived and spent a lot of time during my first year at BCB. Next to these buildings I drew the soccer field, which, based on accounts of other students, was used more frequently in my first year than it seems to be now. Then I drew the Library and the Student Center, the Cafeteria, the class buildings, and of course the church, which is impossible to miss on the way to class. Additionally, I included SPOK and the M1 stop that I take all the time to go home. What I realized later on in the mapping process is that I almost forgot to draw the Factory and the apartments because I do not go there often. Another thing that struck me is that I did not start my map from the Friedrich-Engels-Strasse M1 stop because now I always get off at Am Iderfenngraben to go to my classes or the cafeteria. In my mind, the starting point of the map is the dorm where I used to live in, and the map of BCB is shaped by my experience living here my first year. It was striking for me to compare the other maps to mine because I had a completely different view of our campus. My map of BCB is strongly influenced by my personal experience of the campus. This was an intentional decision because I figured that my own perspective was the only one that I could create a proper representation of. When I started drawing, I imagined myself walking around campus on a typical day. Before I drew any streets, I included what I felt to be important places, starting with the apartment building I live in and later including the classroom buildings, the library, and the cafeteria. I also drew in places that are not technically part of BCB but which I find to be notable visual (and auditory) landmarks: these were the church on Platanenstrasse and the small park in between the dorms and the library. I can see the church steeple from my balcony, and I often hear the church bells when I am in my room. The park has always stood out to me because, as one of the only purely green spaces in the campus area, it reminds me of my home town, which is a very small town in an otherwise rural area. Because of this, I always notice the park and the people in it when I walk by. While making my map, I purposefully distorted the scale of things because I wanted to put emphasis on places that are significant in my experience of the space. Additionally, because my experience of the BCB campus involves my travels to and from campus, I decided to include in my map the M1 tram stop that I make use of most frequently. What surprised me about this process was seeing how dramatically different my perspective of the campus was from other students’ perspectives. At the beginning of the semester, we discussed and explored the sonic profile of the BCB campus. We took an inventory of the different campus sounds, taking note of their individual character and significance. Although we tended to agree on what sounds are present on campus, we had differing ideas about what these sounds mean. After completing the exercise of mapping the BCB campus, we could re-approach the topic of campus sounds in a different light, with a heightened focus on the subjectivity of our understanding of the place. Our reflections on the sonic profile of the campus were inspired by the following quote from Sophie Arkette: “Each community has sets of sound markers which reinforce its own identity; each district has its own sonic profile, even if that profile is not a permanent feature.” (2004: 162). We have concluded that the BCB campus is characterized by the following recurring sounds: cars driving by intermittently, church bells, bike wheels and bike bells, construction, airplanes passing overhead, birds chirping happily, and kids shrieking and squealing while enjoying the wonders of the neighborhood. 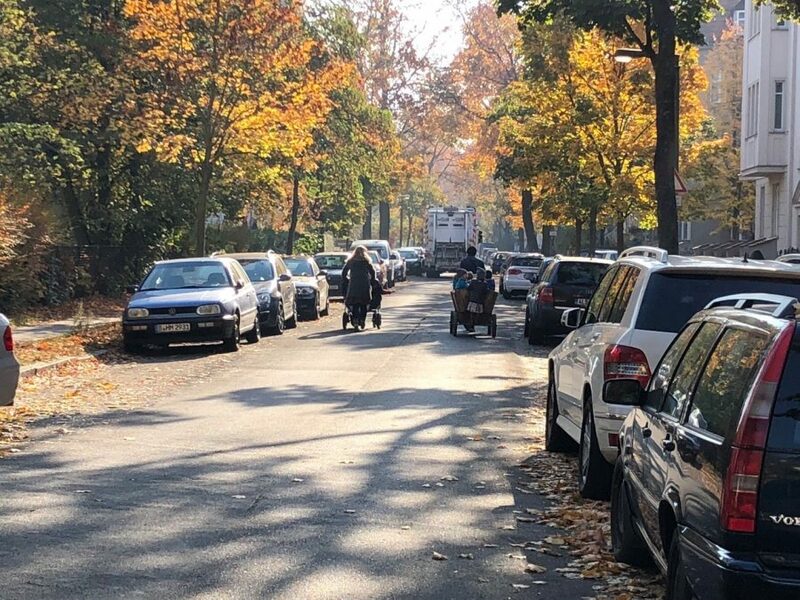 These sounds of the peaceful, family-centered neighborhood of Pankow come to both represent and reflect a specific community identity. Despite our consensus on the general sonic profile of the campus neighborhood, we all expressed different ideas regarding how the sounds fit into our experience of the campus and of Berlin more generally. One of us argued that our campus is characterized by sound markers which can be found elsewhere in the city. From this perspective, community identity is determined by the way the community itself perceives common sound markers and integrates them into a vision of the place. Across the city, what changes is not necessarily the sonic profile, but rather sets of community values and their corresponding worldviews. Conversely, others argued that the sonic profile of the neighborhood is composed of sounds that are very specific to the area. Here there is an emphasis on the stark difference, in terms of sound but also otherwise, between Pankow and “the rest of Berlin”. We noted that we oftentimes think of Pankow in relation to the rest of Berlin. Pankow, in this view, is most notable for its lack of sound. This lack of sound becomes increasingly more noticeable as one travels back and forth between campus and more central areas in Berlin. There are certain “city sounds” that are absent or underrepresented in the BCB neighborhood: cars honking, people yelling, loud music playing, among others. Arkette mentions the non-permanent nature of a given area’s “sonic profile”—this is something that came up in our study of the sounds of BCB. Some campus sounds are sporadic, while a few (like the church bells) are consistent and can even act as markers of time. The sonic profile of the BCB campus is such that on any given day one might observe a combination of sounds that is entirely unique to that time. Additionally, we started to see the ways in which the social and demographic makeup of Pankow is reflected in its sonic profile. The non-permanent nature of the sonic profile is relevant as the dominant sounds in a particular area will necessarily change along with its social and cultural identity. This non-permanence is furthermore quotidian: in Pankow, we can see such changes throughout a single day. In the morning, many parents go out with their kids, and cars drive by. Noon holds airplane sounds and the church bells combined with older people going for a walk with their dogs, and BCB students wander between the campus buildings. The afternoon intertwines all sound groups to create Pankow’s auditory community. It is important to understand that the notion of community can signify different meanings depending on the scale the word is applied to. On the whole, our understanding of the campus changed when we realized how different each person’s experience is within the space. The campus itself is necessarily influenced by how people think about and interact with it—the community environment in particular is in some ways a product of individuals’ relationships to the campus space. The boundaries of a space are largely determined by individual perspectives. Throughout this process we became aware of how much personal experience and bias is imposed onto our sense of place. With this, we can see how important it is to think about this pattern of influence when we consider what it means to live with others and develop a sense of community. One has to keep in mind that all aspects of our lives, even those that we might think of as objective or universal, are rooted in individual experiences. As the class has concluded and the seasons change yet again, the Urban Sounds and Migration students would like to invite all BCB students to contribute to the campus sound map. Our class’s hope is that this map becomes a living one that we can tap into at a moment’s notice. If you would like to contribute to the campus sound map, here is what to do: ZeeMaps is a pretty easy map platform to navigate. In order to add a sound clip go to Additions in the menu bar and click on Add Marker – Detailed. In the Location section you can either insert the exact address or click on the map and the address will get added automatically. Make sure to give it a name (Leaves, Construction, Street Corner, etc.). In the Details section, enter the date and time. In the Media section, upload the sound clip (only mp3) and an image. Make sure to save the URLs as you may want to edit your posts later! Please note that if the sound you record on your devices doesn’t come in the mp3 format, you can convert m4a to mp3 either through iTunes or Zamzar. If you’re using other sound formats, they can also be converted into mp3 pretty easily. Just google how to do it. We hope this map will serve as a living memory of the campus through our collaboration.